Nick Foles stood on the podium in Minneapolis after the Super Bowl with his daughter in one arm, the Lombardi Trophy in front of him, a worldwide audience watching him, and the standard for him forever raised. Winning the Super Bowl MVP comes with its perks — a trip to Disney World, a best-selling book, an indefinite period of fame. But it also casts an inescapable shadow. Every time Foles takes the field for the rest of his career, he's the Super Bowl MVP. If a No. 2 quarterback turns the ball over three times in a preseason game, it's less newsworthy than when the Super Bowl MVP does it. Even when they're the same person. "No, I don't," Foles said when asked whether he feels the need to live up to the Super Bowl MVP standard every week. "I know that this game is a process. I've played this game my whole life, and I haven't always played great games. These are the toughest ones, where you have to keep battling. It really shows what you're made of. I was going to keep firing no matter what. I didn't want to throw any more picks, but if I threw another one, I was going to keep firing the ball. You can't play with fear." Foles has played two preseason games. One ended with injury, the other ended with insult. In the second preseason game in New England, Foles went 3 of 9 for 44 yards and a fumble before a shoulder injury halted a poor outing. On Thursday in Cleveland, Foles went 13-for-17 for 127 yards with a fumble, and two interceptions, and he tripped in his own end zone to cause a safety. He made some impressive throws throughout the first half, but the turnovers blemished his evening. When he had the chance to end his summer on a positive note while driving the Eagles near the end zone late in the second quarter, he threw an interception into double coverage. "It's no fun playing the way I did," Foles said. "It really hurt us tonight. But I know that I can improve, and I will." It has raised an obvious question: What's wrong with Foles? Foles acknowledged that "I haven't been myself" during the preseason and he's "just making some mistakes." But he has also built enough equity that it's imprudent to panic because of his preseason performances. Coach Doug Pederson emphasized that the Eagles have kept vanilla offensive schemes and haven't tailored the playbook to some of Foles' strength, such as run-pass options. If this were the regular season, the game plan would be different. Plus, he hasn't had the same supporting cast that he had in the Super Bowl or that the Eagles hope to field in two weeks. Foles often talks about rhythm, and a regular season start would allow more opportunity for that rhythm he desires. Even with those conditions, Foles is better than he has shown. 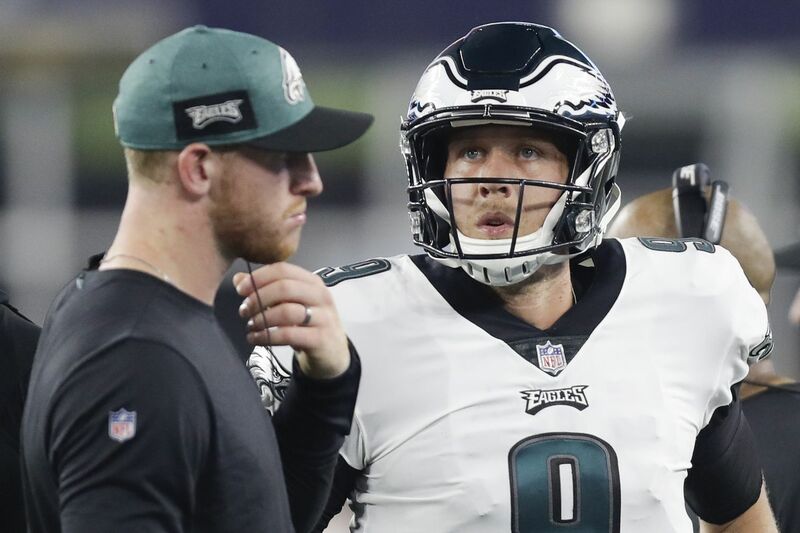 "I think sometimes there's too much pressure on yourself and you press to make a play, or whatever it might be," Pederson said of Foles' mistakes. "I don't know. It's tough." For anyone who has watched Foles closely in his career, what happened on Thursday shouldn't be shocking. He was exceptional in the Super Bowl and the NFC championship game. One month earlier, he was unproductive in back-to-back starts to close the regular season. Foles rides the pendulum between outstanding and ugly more so than most players, and the high variance is evident in his statistics. He has 18 starts (including the playoffs) with a quarterback rating greater than 100. He has 16 starts with a quarterback rating less than 80. He has only eight starts in between. "I've learned a lot in those games," Foles said. "That's where I can lean on all those experiences. … Continue to improve, not being too hard on myself while being hard on myself. If you're too hard on yourself all the time, that's when you begin to crumble." So the obvious question is when that "next game" will come. It could be on Sept. 6, when the Eagles host the Atlanta Falcons in the season opener. But he'll start only if Carson Wentz does not receive medical clearance in time to play. The Wentz Watch will shift into a higher gear during the next few days, with the alarm clock ready to sound on his stated goal of starting Week 1. Wentz is participating in every practice drill that he would as the starting quarterback, but because he doesn't have medical clearance for contact, the Eagles have split the first-team reps between him and Foles. The starters will begin preparing for the Falcons upon returning to practice Sunday, and Pederson will need to formulate the game plan for whoever starts at quarterback. Foles said he will take some time to catch his breath. He'll enjoy the company of his wife and daughter without a game to play this week, and he'll prepare to start Week 1 — whether he's the starter or not. "I go back, I study film, I do my prep week, like I've done," Foles said. "I get my body right. Continue to bond with these guys and be ready to roll." In Foles' book, Believe It, he wrote about how his father told him after an ugly outing against the Raiders last Christmas, "You are the most dangerous player in the world right now. When everyone doubts you, that's when you come to life and really light things up." Foles is not necessarily being doubted this time. The Super Bowl MVP performance all but eliminated that angle. But now the new challenge is living up to that lofty distinction. It's true that Foles has often rebounded from these types of games. Except with Wentz trying to return for Week 1, no one knows yet when Foles' next chance will come.